I’ve said it before, and I’ll definitely say it again after this post… but throughout human history creativity has often been thought of by the masses as a gift from another world, not something that comes from the brain and which can be developed and cultivated. I bet you thought I was making a reference to TMNT, nah, I would never do that. Moving right along; as a creative person I’m sure that this concept of creative influence is both fascinating and horrifying for you, because you want to succeed and get support to accomplish your creative goals, but if anyone can be creative, then that means you are no longer a special snowflake. And I’ll let you decide which one fascinating, and which one is horrifying. But what if I told you that your environment can be controlled in such a way as to effect your creativity either positively or negatively? What would you do? I bet most of you would jump at the chance to make subtle shifts in how your environment operated. For instance, did you know that colour can elevate different kinds of creativity? According to this study, red can promote analytical aspects of memory retrieval and proofreading, whereas blue is good for brainstorming and innovation. Also in the same study, researchers have uncovered a correlation between noise levels, distraction, and types of work done – moderate noise and high noise produce more abstract processing vs low noise, but high noise impairs information processing, so moderate noise is the sweet spot for creativity, something which I touched upon in a previous post. The most interesting thing about this study, of course, is that it demonstrates the correlation between creativity and improvement. Another article I found recently references other aspects of life which can impact creativity. This is another one which Professor Juliet Zhu has looked into, and is a huge advocate for. Apparently dim lighting vs bright lighting an produce different results. Believe it or no, dim lighting has a positive association with abstract thinking and creativity. 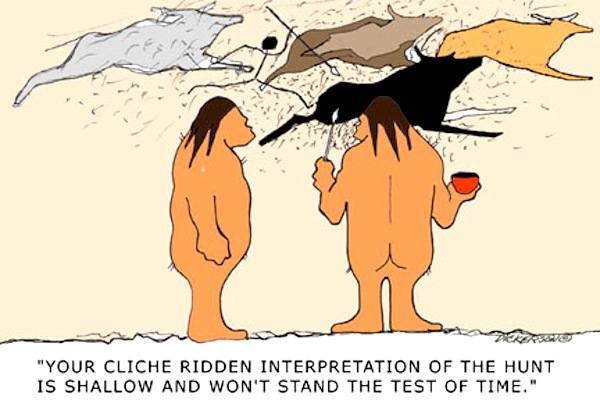 Maybe that’s why cave painting started us off on this creative pathway in the first place? But the article goes on to demonstrate that temperature and space make a difference too. Choose a cool setting for simple tasks and a warm place for complex ones. Clutter creates less self-control (binge eating for example), whereas organization creates self-regulation and persistence, both useful in their own situations. And that latter topic also happens to be something I’ve written about previously. Still another article I read described the importance of writing out ideas by hand, which helps with idea generation, learning, and memorization. And apparently taking walks and working in rooms with high ceilings helps to promote creativity too. But what you may not have considered is the importance that comfort can play in creativity both physical and mental. Having a space which has both small areas of intimacy and large open areas can stimulate different kinds of thought. And of course, you also need to be able to experiment and fail at projects. No one is capable of perfection, but surrounding yourself with individuals that do not support risk-taking stifles creativity quite a bit, so do what you can limit those kinds of interactions. It is imperative that you consider your relationships carefully, and to be closely surrounded by positive, supportive people who want you to succeed, and it’s also necessary to have critics. Though I suspect we can touch on that last point in a lot more detail and so I shall save it for another day. What did you think of that theory? Does your environment fit the conditions above? Have I missed anything? Please leave some comments below, like and share this post, and of course please subscribe to my blog for more stimulating ideas about the arts.